10-year-old Marilyn Coulter stands in the basement of her house contemplating the blackboard on the wall. Coloured chalks lay waiting for her. As she begins to draw, the chalk whispers across the blackboard, trailing coloured lines that had previously only existed in her imagination. This was Marilyn’s introduction to art. As she got older, her medium would shift from a blackboard in the basement to the white of an artist’s canvas. Marilyn was hooked. Growing up in Toronto, she first began to paint in High Park and along the banks of the Humber River. She was only 10 when she completed her first oil painting, and 11 when she finished her first watercolour. 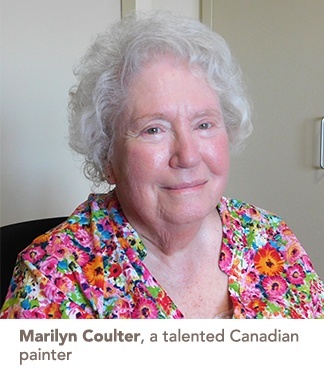 Marilyn studied at several art schools in Ontario and at the Instituto de Allende in Mexico. She’s received numerous awards for her art, including second prize at the Canadian Open Show in 1971, Best Floral in 1992, three Juror awards in shows at the Belleville Art Association and the Humber Valley Art Club, which she was president of for several years. In the late 1970s, Marilyn designed and painted backgrounds and sets for the Ontario Ballet Theatre, an experience she greatly enjoyed. “My painting is all about trying to capture the feeling of the day — the wind in your hair and the sun on your face. It's the feeling in a painting,” Marilyn said. She’s also happy to share her skills with others, and taught classes through Loyalist College in Belleville. Teaching is something she continues to do today at Silverthorn Care Community in Mississauga where she lives. She’s been holding monthly art classes for fellow residents, and they’ve been a huge success according to team members. Marilyn’s daughter has catalogued all of her artwork, which Marilyn believes may total over a thousand pieces. Many of them can be found on her website. Each one is unique, and brimming with emotion.